I have written in previous posts about the importance and value of shot stopping. So how have goalkeepers in the real world done so far this season? I collected data on the current Premier League, La Liga and Bundesliga seasons from Sports Illustrated’s website and put it all together into the following graph. The data includes every match played from the start of the season to April 13th. 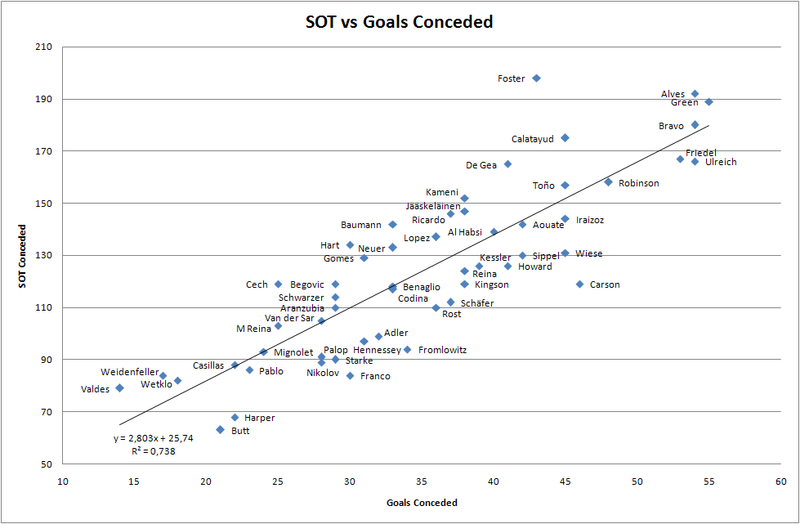 Note that I included only goalkeepers who have played at least 1500 minutes. In the following table I have listed every goalkeeper’s goals allowed, shots on target faced, minutes played, saves made and EV Diff, which is a measure of how much a goalkeeper has over- or underperformed relative to expectation based on how many shots on target they have faced. Ben Foster’s 18,46 goals means he has conceded 18,46 goals fewer than would have been expected based on how many shots on target he has faced. Scott Carson on the other hand has conceded 12,73 goals more than expected. Clearly this analysis isn’t perfect. 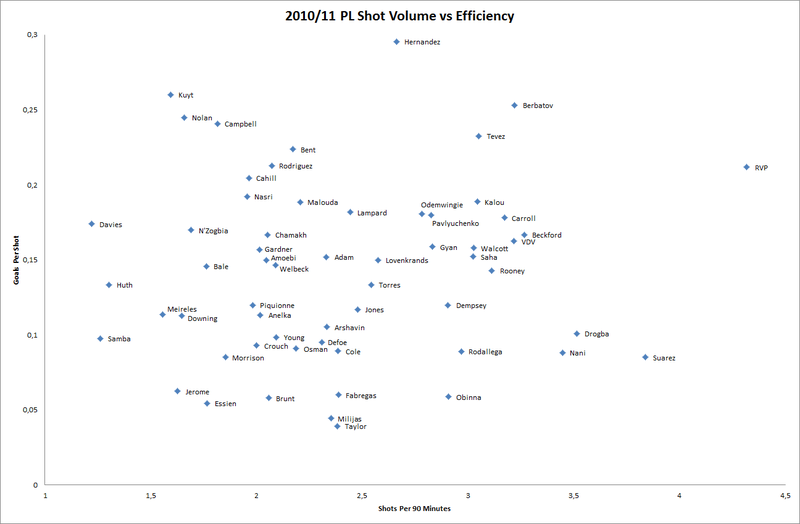 For starters it considers all shots as equal, which clearly isn’t true. Some shots are more difficult to save than others, and some goalkeepers will have faced relatively more difficult shots while others will have faced relatively more easy shots. For example, has Petr Cech really performed 8,27 goals above expectation or has he just faced a disproportionately large number of easy shots which serve to make it look like he has performed better than he actually has? I don’t know. Certainly these numbers shouldn’t be taken as gospel and should instead be thought of as a supplement to your eyeball test when evaluating goalkeeper performance. But perhaps they are useful, if for no other reason than to get people to think about why they may not be an accurate representation of reality and what could be done to improve on them. Over the past few months I have become increasingly frustrated at the lack of objective analysis in football. Almost all football debate be it in the pub or on the internet inevitably devolves into a game of this is my opinion and this is your opinion, let’s see who can shout the loudest. Bonus points are awarded for insulting your opponents, having the highest word count and never admitting you’re wrong. The most common method of player evaluation is the subjective and unreliable eyeball test. You watch a match involving 22 players where often you will be rooting for one of the teams or one of your favourite players to do well, most of the time you will be focusing on the player with the ball and ignoring what happens around him, and by the end of the match you will probably already have forgotten most of what happened at the start. All this is then passed through the filter of various biases in the brain which we know is notoriously poor at evaluating events objectively. The end product is a hodge-podge of incomplete data seasoned with all your favourite biases and predetermined notions of how you think things are supposed to work, and this is what you use to draw your conclusions from. The limitations of this method are obvious yet rarely if ever will you see someone question it, instead we all have an unspoken agreement that this is the way it has always been done and this is the way it should be done. There is a need for objectivity in football analysis. The use of statistics and mathematics in addressing problems of player evaluation, team evaluation, and on- and off-pitch situations in football is still at an elementary level when compared to other sports like baseball and basketball but I feel strongly that it is the only way we can move football analysis away from the clutches of subjectivity and into the warm embrace of well-reasoned, logically sound objective argument. That isn’t to say that these methods don’t have their limitations and weaknesses, and certainly football presents a unique set of problems that sports like baseball or American football don’t have to deal with, but rather than shying away from them we should be tackling them head-on in an attempt to move the level of football analysis away from the age of cavemen and into the modern era. Nonetheless it is an unavoidable fact that the eyeball test is still a vital part of the way we evaluate and analyse football. Despite growing popularity the football analytics movement is still in it’s infancy and it will be a while before we have the tools to answer truly meaningful questions about the game without having to rely on the eyeball test. Until then the best we can hope to do is supplement our subjective assessment with statistics and mathematics and constantly audit our thought processes for faulty logic and inconsistencies. As Leibniz wrote: “we are all mere Empirics in three fourths of our actions.” If we could get that down to one half or one fourth then at least we will be moving in the right direction.